Don't let a blank wall get you down! Create a truly custom interior that suits your style and needs—be they temporary or permanent—with one of these two DIY wallpaper methods. Wallpaper is having its moment again—and we’re not talking about the stuffy prints you remember seeing in your grandmother’s house as a kid. The sky’s the limit nowadays, especially with all the options for creating your own prints. The newest trend in interior design has homeowners customizing wall coverings with beautiful printed papers or fabrics, in both permanent and temporary styles. Confused, and wondering how you can cash in on this crafty project? Read on for a detailed how-to, then grab a partner to get started. 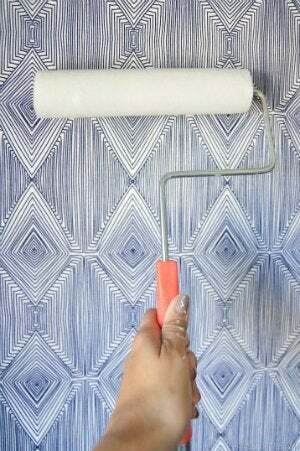 You can adhere just about any type of paper—including gift wrap—to a wall using wallpaper paste. Tip: Skip thin, shiny wrapping paper, which is very challenging to hang without it wrinkling. Instead, choose a thick, higher-quality wrapping paper with either a repeating pattern that’s easy for you to line up or a random print that won’t need extra attention—this will all help make your job look pro instead of pathetic. 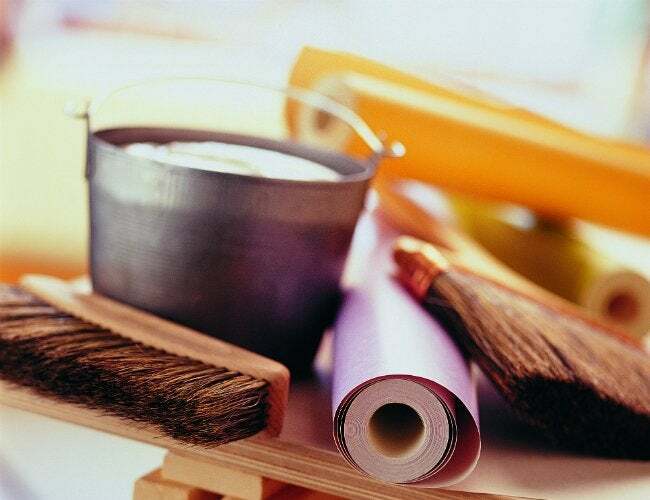 First, prep your work space by covering the floor with a drop cloth in case any wallpaper paste should slop or splatter. Cut your paper into ready-to-hang pieces. Hop onto your step ladder to align the top edge with the top of your wall; unroll the rest so that it measures roughly the length of the wall, with a little extra on the bottom. Cut your length, and use painter’s tape to lightly hold it in place while you unroll your second column of “wallpaper” and match up the pattern. Continue this all the way down the wall. Pour the paste adhesive into a paint tray, and work with one panel at a time. Remove the tape from your first paper, and lay it on a flat surface so you can apply paste with a roller directly to the back of the paper. Be careful not to oversaturate. If instructions on your can of wallpaper paste require it, “book” the wallpaper so that the paste completely penetrates. Do this by curling each end up to the middle of your paper, then lightly pressing the pasted sides together as much as possible without creasing the folds. Wait the length of time suggested on the can before unfolding the top end. Align the top of the wrapping paper once more to where the wall meets the ceiling or the molding. Press the paper into place, and smooth it downward with clean hands. (You can use a damp sponge to remove any traces of excess paste on the wall.) If you’ve booked your paper, unfold the bottom end when you reach the middle, and continue to smooth the rest of the way down. If you need to make any cuts to fit around molding or hardware, trim with your X-Acto knife and then use the small foam brush to lightly spread the wallpaper paste along the edges and stick it to the wall. Repeat Steps 3 through 5 with the next sections of wrapping paper until you’ve covered the full wall, taking care to smooth down the paper and get rid of any bubbles as you go. When you’re finished, let the walls dry following the instructions on the paste container. Whether you inhabit a rental or just enjoy changing up styles from year to year, a wall covering with the flexibility to come down easily and leave your wall damage-free is like a mini miracle. Use the following instructions to create your own temporary wall motif using your favorite cotton print fabric as your “wallpaper” and liquid fabric starch as an adhesive. When you’re ready for a change, removal is as simple as softening the wall covering with warm water and a sponge, and then pulling it off. Whichever fabric you decide to use, make sure you have enough square footage to cover the wall and then some—you’ll want at least a few feet extra so you have room to reposition pieces when you’re lining up the print. Wash and dry the fabric, then cut off the white edges with a good pair of fabric scissors. Also, give a quick wash to the wall you’re going to be hanging the fabric on, and let it dry thoroughly. While it’s drying, lay out a drop cloth to keep your floors from being ruined. Attach your fabric to the wall with thumbtacks, and cut it roughly to size, leaving a little excess at the ceiling and baseboard. Do the same for all panels of fabric until your wall is completely covered. Then, use your utility knife to cut around any fixtures or molding in the middle of the wall. Unfasten a portion of the cloth so that you can thoroughly coat a patch of wall with fabric starch. Work in only one small area at a time—the starch dries fast. Position the fabric on top of the liquid starch, and smooth it down. It should start sticking to the wall immediately, but replace the thumbtacks once more to hold it in place while it dries. Continue until the entire wall of fabric has a starch backing. Roll over the fabric with the liquid starch. Make sure the fabric is completely covered, and really drench it with fabric starch so that the starch seeps through the fabric and onto the wall. Allow the starch solution a few hours to dry completely, then pull out the thumbtacks, and slice off any excess fabric at the molding and/or baseboards using a utility knife.